For much of what we are accustomed to seeing around Christmas, the candles, trees, the mistletoe, the decorations, and many of the songs, we need to thank the Germans. Not specifically those residents of the modern nation state of Germany, but the historic Germanic-speaking peoples of central Europe, for whom the birth of our Lord and Savior was a thinly-veiled opportunity to get out there into the frosty air, bedeck conifers with a variety of junk, quaff heavily-spiced glühwein, and bellow carols in to the night in return for sweetmeats. I would wager that among the English-speaking peoples, certainly the British, the willingness to credit to our Franconian-speaking brethren for these festive trappings is reluctant at best, primarily for, you know, historical reasons. Those of you who follow international soccer tournaments, may also know that we have the oh-so-crazy Germans to thank for Paul the Psychic Octopus, whose soothsaying powers at foretelling the outcome of key clashes were demonstrated with an 85% accuracy rate throughout the 2010 World Cup. I count myself among the gamblers who were disappointed that Paul passed into the great mystery that surrounds us prior to this year’s competition. It’s perhaps no surprise then to learn that the Germanic penchant for invertebrate oracles should have been combined with the already Deutsch-tinged Christmas celebrations in Britain’s latest campy attempt to find the most ludicrous and tabloid-friendly ways of amplifying the pre-Yuletide excitement. For this December, Manchester Sea Life Centre’s very own Miranda the Octopus is counting down the days to the happy birthday Jesus party with her very own Lego (TM) advent calendar — opening each numbered door in turn to extract a fishy treat. If that doesn’t soften the hardest hearts to the joys of the season, I cannot guess what would. In our own, rather typical, perversion of this headline-grabbing stunt, we resolved to select an octopus to eat every day this Adventide. Sadly, we couldn’t find the time to perfect our soon-to-be-patented invertebrate-themed Advent calendar, but we did recently harvest a bevvy of baby octopus for the Peruvian classic dish Pulpo al Olivo, octopus in olive sauce. Pulpo al olivo is another fascinating outcome of the wonderful fusion between the magnificent bounty of Peruvian seafood and Japanese immigration to that country, which we must thank for a variety of other seminal dishes including the ceviche-like tiradito. Like those more famous preparations, as little as possible is done to the fish by way of cooking, and providing you have a blender and a few basic kitchen staples, there is nothing in pulpo al olivo that even the worst cook could find intimidating. In fact, as you’ll no doubt have already surmised, this dish has nothing whatsoever to do with Christmas apart from a very tenuous link to aquarium-based prognosticators. However, like invertebrate fans across Europe, we feel strongly that somehow shoehorning an octopus into your festivities adds a certain enigmatic quality, so we encourage you to consider dashing out for some at the last-minute. It would certainly make for a palate-tingling contrast to the richer, heavier and more traditional repasts. Mix 3/4 cup + 2 tablespoons of neutral-tasting vegetable oil with 7 tablespoons of good olive oil and gradually pour into blender while motor is running. When sauce starts to thicken like a mayonnaise, increase speed and add 15 Peruvian botija (or Greek kalamata) olives (pits removed) and a dash of Worcestershire sauce. Blend until smooth and purple. Keeps for up to a month in the fridge. In a medium-large saucepan, place octopus with garlic, bay leaf and peppercorns. Cover with a tight-fitting lid and cook over low heat for 45 minutes. Do not add any water or salt. The octopus contains plenty of water that will seep out during cooking and steam the octopus in the pan. After 45 minutes, remove octopus from pan and discard any cooking liquid. 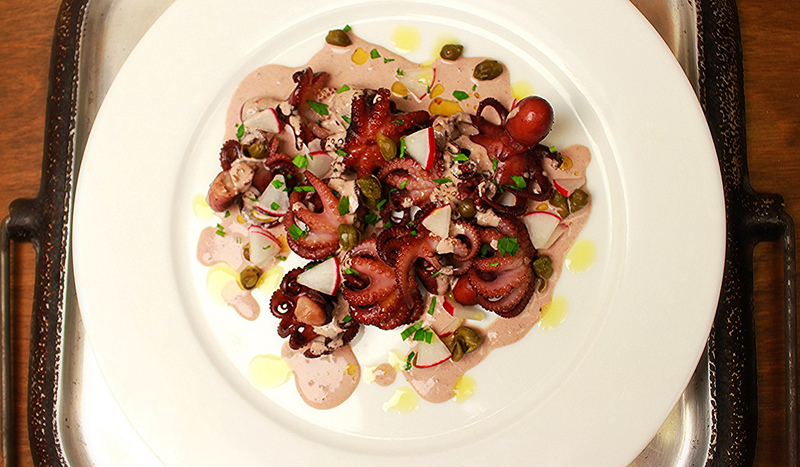 Serve octopus be-drizzled with olive sauce, and sprinkled with capers and chopped parsley. Dress with your best olive oil. Serve with sparkling white wine or champagne. This DOES have to do with Christmas, if you think of it as one seventh of the Feast of the Seven Fishes….right? Only a slight stretch…. 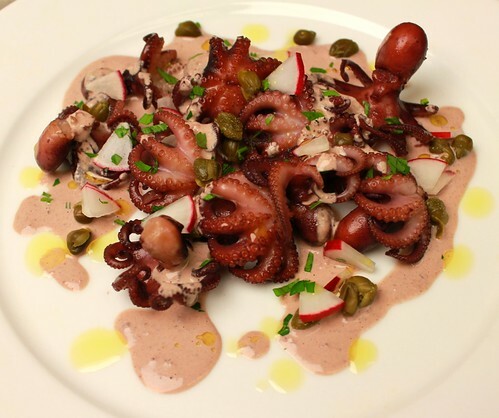 We had a similar dish in Barcelona which you are very familiar with, but maybe you’ve never had (or HAVE had) our Hawaiian style Tako Poke that uses octopus ,instead of the more common ahi tuna poke, also very good, but I prefer the chewy octopus– My coworker put 3 boxes of Vigo Pulpo in various sauces in my “stocking” this year and one box makes a nice little lunch here at work if I remember to bring some cooked pasta with me. I was glad to see this post when I got to work today—I needed to read something really good and (bonus!) humerous before I start—so thank you! I’ll consider it my second favorite gift (after the Pulpo–haha) and wish you and Amy and the Lit’ uns a very Happy Merry Buono Bella Christmas! Mele kalikimaka and Happy New Year! @Deb: Good thinking! We didn’t make that connection, though we did make all 7 fish one year, and our guests begged defeat after five leaving us with pounds of lobster fra’ diavolo over homemade tagliatelle and a small pile of fried sprats feeling rather left-out. But (belated) Merry Christmas to you too! Hope you’re enjoying your canned pulpo. Wish we had some co-workers like that! Conservas like that are wildly underrated in this country. And happy New Year! Hope you’re doing something fun – more fun than we’re looking at with two kids, no money for a babysitter, and very little likelihood (or ambition) of making it anywhere near midnight! I’ve been looking forward to this post! I finally found some frozen octopus – it looks to be about two in the package that weighs a little over a lb. I remember in a previous recipe you poked the heads before cooking. Why didn’t you do it this time? I’m not sure how long I should cook these guys – maybe a bit longer because of the size. Thanks for my Christmas laugh. It is helping to clear my fogged brain before we head to the next party. I was thinking of when Jesus fed the crowd with all the fishies…..
Have grand Christmas and a cool year ahead! Hope you had a great Christmas and Happy New Year, loyal reader! I’m going to have to try to find some baby octopus at our new fish market–do you find it to be a little more tender than a full-sized octopus? Thanks for the shout-out on the tiradito! I’ll have to check this out. @Elizabeth: funnily enough, almost without exception octopus can be tough or tender regardless of size based completely on how well you cook it. This method is pretty good, and yields a tender ‘pus without any of the rubbery-ness baby octopus sometimes has. That said, if you can find reasonably-priced full-size octopus, I’d recommend you go with that but cook it for another 15-25 minutes, depending on whether it’s a small or larger specimen. I’d love to do a “7 Fishes” with all raw fish, clams, shrimps, etc..and NOT to just get out of having to cook. It might even prove to be harder, thinking of different dipping sauces and all–and I may be dreaming, but I don’t think I would have begged off a single bit of your dinner that year, it just sounds so d— good. @Deb: raw bar is definitely the way to go! Happy New Year!